Can you tell how far the stars are just by looking up at the night sky? You could if all stars were identical. Then, if star A appeared four times dimmer than star B, it would have to be twice as distant; if it appeared nine times fainter, it would lie three times farther, and so on. But stars are not alike, and therein lies the rub. Each star pumps out vastly different amounts of radiation, and we can't assume that a star is farther just because it appears fainter. In fact, the opposite is often true — the brightest-appearing stars are farthest away. This occurs because stars radiating the least can be seen only if they're relatively nearby; those that are most luminous are much less common, but we can see them at greater distances. 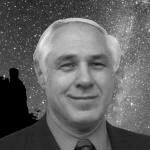 So, it's not just a matter of judging star distances based simply on their brightnesses. One way we can measure stellar distances directly is by triangulation, a technique we all learned in elementary school. Hold your thumb out at arm's length and alternately blink your eyes. Your thumb will appear to shift its position relative to background objects; move your thumb closer to your eyes and the shift you see will become larger. Your brain knows how far apart your eyes are, and from the thumb's shifting position it can estimate pretty accurately how far away it must be. We can do the same with stars, not by blinking our eyes, of course, but by measuring their exact positions at six-month intervals, when the Earth lies on opposite sides of its orbit around the sun, say, once in summer and again in winter. If the star appears to shift its position between these two times, we can calculate how far it must be. Unfortunately, this works only for the nearest of stars. For more distant stars, astronomers must be more clever. And, indeed, they are. They've found an entire class of stars that serves as an accurate cosmic yardstick. 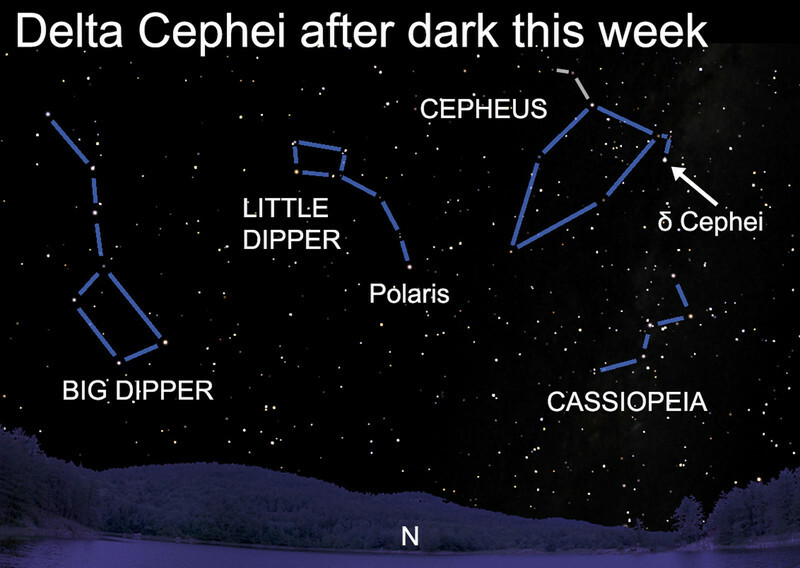 The first of these stars to be discovered is known as Delta Cephei, and we can find it easily with the naked eye in the constellation Cepheus, the king, in the northeastern sky after dark this week. This star oscillates in size and temperature and appears to brighten and fade in our sky every 5.3 days. Not until 1912 did Harvard College astronomer Henrietta Leavitt notice that the average brightnesses of such "Cepheids" was related to their periods of pulsation. From this astronomers soon developed a "Period-Luminosity" law, which states that the longer it takes a Cepheid to undergo one cycle, the more intrinsically luminous the star must be. Armed with this new law, astronomers can measure the period of a Cepheid anywhere in our galaxy (or beyond) and easily infer its actual luminosity. And by comparing how bright it appears with the light it's actually emitting, they can calculate its distance. In this way, Cepheid variable stars have become one of astronomers' most valuable cosmic yardsticks and help them to measure the size of the entire universe. And there's one right over your rooftop after dark tonight. See a cosmic yardstick after dark this week.